Activator Studios has helped build Hunter RMV into a world class brand. They’re extremely knowledgeable in everything design, websites, and marketing and continue to impress us daily. The Horizon Interactive Awards, a leading international interactive media awards competition, has announced the 2018 award winners to highlight this year’s “best of the best” in interactive media production. 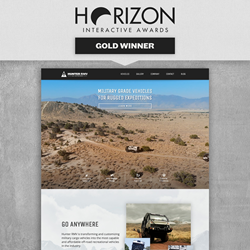 Activator Studios was recognized for their excellence with a GOLD award for the Websites - Promotional Category for their website design with Hunter RMV, maker of expedition vehicles. “Activator Studios has helped build Hunter RMV into a world class brand. They’re extremely knowledgeable in everything design, websites, and marketing and continue to impress us daily.” Keith Storey, founder of Hunter RMV. Focusing on aesthetically unique websites, Activator Studios has been at the forefront of website design for over two decades. A culmination of experience and a close working relationship with Hunter RMV were critical to envisioning a new brand in the auto space that would span across digital and physical mediums. Hunter RMV's website design has been the catalyst to a growing expedition vehicle company's footprint worldwide. The 2018 competition saw entries from around the world including countries such as: Austria, Belgium, Canada, Czech Republic, Greenland, Hong Kong, India, Ireland, Italy, Japan, Malaysia, Portugal, Russia, Singapore, Spain, Sri Lanka, Switzerland, Turkey, Taiwan and the UK. An international panel of judges, consisting of industry professionals with diverse backgrounds evaluated categories ranging from online advertising to mobile applications. The 2018 winning entries showcase the industry’s best interactive media solutions including web sites, mobile applications, print media, interactive displays, public exhibits, online advertising, video, email and more. In its 17th year, the Horizon Interactive Awards was created to recognize excellence in interactive media production worldwide. Since 2001, the competition has received tens of thousands of entries from many countries around the world. Each year, those entries are narrowed down to the “best of the best” to be recognized and promoted on an international stage for their excellence. The judging process involves a blend of the Horizon Interactive Awards advisory panel and an international panel of volunteer judges consisting of industry professionals. Winning entries have been dubbed the “best of the best” in the interactive media industry.